Corrective jaw surgery (orthognathic surgery) is performed by oral and maxillofacial surgeons to correct a wide range of minor and major skeletal and dental irregularities, including the misalignment of jaws and teeth, which, in turn, can improve chewing, speaking and breathing. While the patient’s appearance may be dramatically enhanced as a result of their surgery, orthognathic surgery is performed to correct functional problems. Your orthodontist will determine whether you are a candidate for corrective jaw surgery. It is important to understand that your treatment will probably include orthodontics before and after surgery. Corrective jaw surgery may reposition all or part of the upper jaw, lower jaw and chin. When you are fully informed about your case and your treatment options, you and your orthodontic team will determine the course of treatment that is best for you. 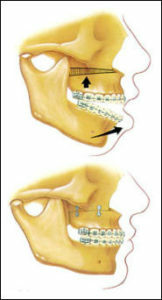 The good news is that jaw surgery may be unnecessary if orthodontic treatment can correct the problem. This is sometimes possible with the latest advances in orthodontics. More information about orthognathic surgery can be obtained at Arnett|Gunson, a website of two local orthognathic surgeons with whom Drs. Edstrom, Trigonis and Swenson have worked very closely for over 15 years.